Jonny Appleseed comes down through history as a cartoon character—a mythical frontier figure with a burlap sack for a shirt and a tin cook pot for a hat. But Jonny Appleseed was a real person. John Chapman was born in Leominster, MA, in 1774. He went west as a young man to plant apple trees in the wilderness of Ohio and to spread the gospel along the frontier. He walked barefoot into wild country where no white man would go. He was fearless, generous, warm-hearted, and eccentric; the Indians thought he was touched. He lived to be 80 years old and he was already a legend in his own lifetime. John Chapman would trek alone into the deepest wilderness, far ahead of the advancing frontier, and plant huge fields of apple trees from seed. When the first settlers caught up to him, years later, he would sell them well-grown apple tree saplings. John Chapman grew thousands of apple trees for the pioneers of Ohio. The apples on his trees grew sour, and were not for eating, but for brewing cider. Cider was the wine of the frontier, but John Chapman was no backwoods Dionysus. Cider eased the earthly pain of the settlers, but the real comfort John Chapman offered was spiritual. 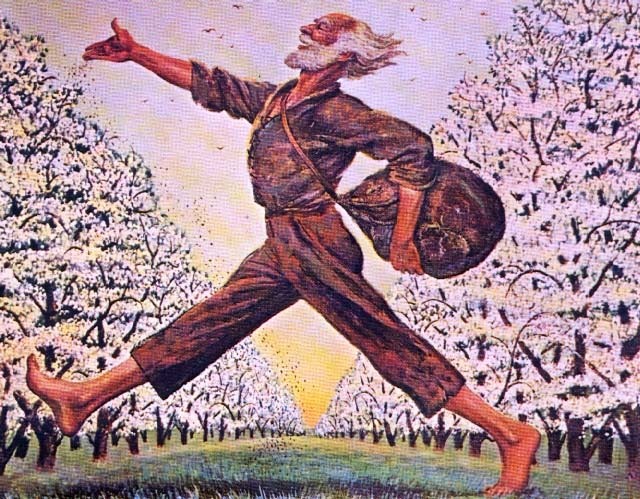 Jonny Appleseed was a missionary. He was the toughest man on the frontier, and the meekest. Indians and white men alike marveled at his courage. But he would not kill an animal, not a rattlesnake, a wasp, or even a mosquito. In a land where men strove to conquer the wilderness, he sought harmony with the forest. John Chapman paid visits to countless families along the frontier, and his preaching was as welcome as his apple saplings. He captivated the lonely and isolated settlers with tales of adventure, and the moral of every story was salvation. He left the settlers with apple orchards to bear fruit, and with pages torn from his well-traveled Bible, to bear a different kind of fruit. John Chapman died a wealthy man thanks to his apple trees, but didn’t care; he never even counted his money. The real Jonny Appleseed could not count his harvest until the hereafter, because the garden he hoped to plant is not of this world. « Backyard Chicken Basics Class, this Saturday, May 3rd! Wonderful, Justin! We pray the harvest of your righteousness to preceed you as well!!! Blessings! Hello Lisa! Thank you so much! Kayla and I are wishing you the very best! Enjoy this beautiful day! What a wonderful tale, filled with details I didn’t know. People who say a single person can’t make a difference should take heed. I could not agree more! I hope you are doing well and enjoying a beautiful sunrise over the water this morning!